The starry sky, beautiful sand dunes, the sunrise and sunset in the Sahara Desert have always been fascinating to me. Even since I was a schoolboy I knew I would someday go to the Sahara Desert. 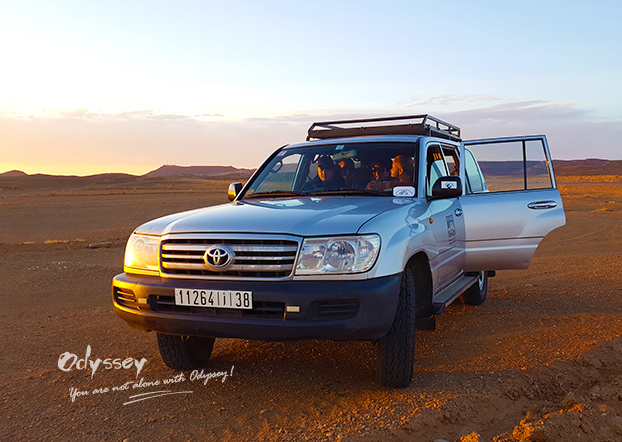 It came true this March, 2017, when I was lucky to join my Odyssey colleagues Candy and Thomas on a tour of inspection to Morocco to check the local hotels, attractions, tour guides and vehicles. 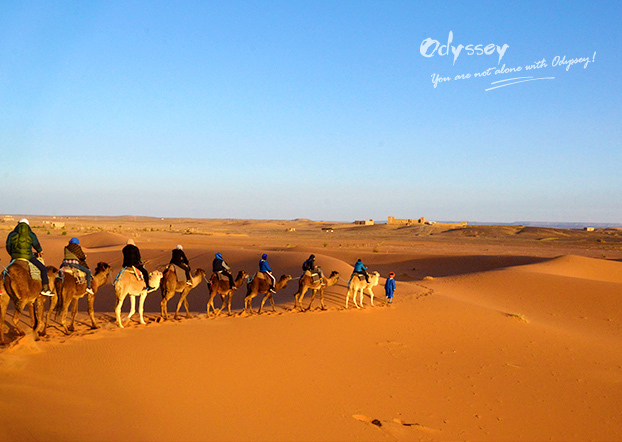 Our visit to the Sahara Desert was a part of our wonderful Morocco tour. It was close to the evening when the SUV took us to the desert camp. There was warm afternoon sunshine when we headed deep to the desert. 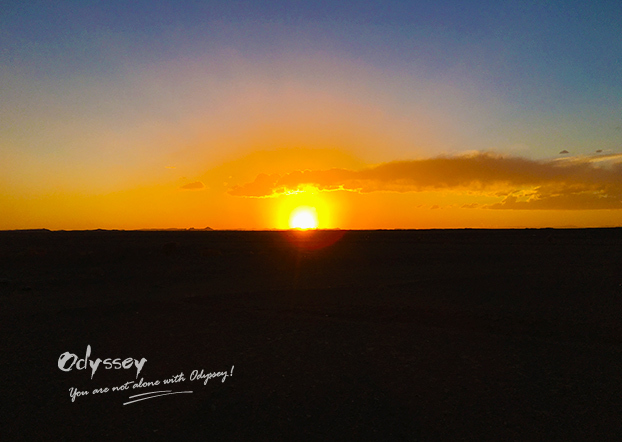 Our vehicle stopped at a flat place where we could enjoy the most beautiful sunset in the desert. The sun appeared to be larger and redder, lightening the distant deserted hills. It looked as if the hills, which were whitish seconds ago, now were adorned with a soft loop of ribbon. Clouds got more heavily colored when the sun was approaching the horizon. The moment the sun disappeared in the horizon, everything changed: Layers of clouds were dyed, all floating comfortably in the blue sky, like shiny smooth satins with orange-red floral patterns; surrounded in the red, the faraway vegetation on the sand dune also seemed more vibrant. 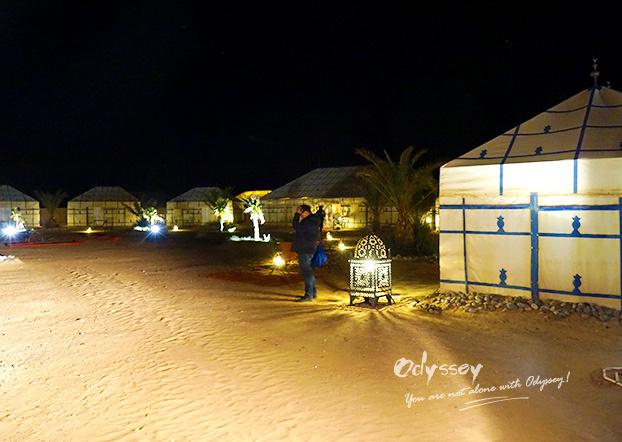 After soaking up the scenery, we proceeded to Merzouga Desert Camp. We arrived before night fell. The camp was small, but the tents were big. We decided to have a glimpse of the tent before we watched the starry night. So we entered the tent. There were three beds, a bathroom, a flush toilet, a shower cubicle, an air conditioner, etc. It's incredible! 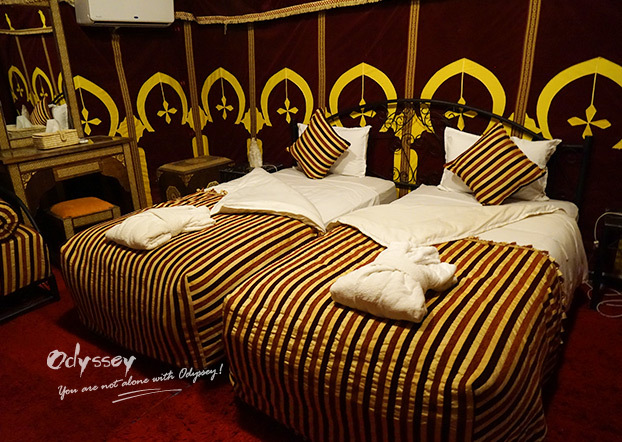 We never expected such luxurious and spacious tents in the desert. It would guarantee a good overnight stay. We gave our face a quick rinse and went outside. Just as we thought the most beautiful part of our Sahara experience is about to begin, a strong wind came without warning. Sands started to blow everywhere. They were like little pervasive devils running towards you, into your ears, nose and mouth. We couldn't help but smile: we would have to wash our face again and delay our star gazing plan. So we went back to the tent, waiting for the sand storm to stop. While not knowing when the wind ceased to blow, we had dinner in the canteen and then were entertained by traditional Berber music. We learned later that Berber people have great culture and spirit. They were natives of the desert and lived a nomadic life. But don't assume that their simple lifestyle makes them ignorant. They are humble and very talented musicians. They are happy with what they have and more importantly, they know how to live in the present. It's almost midnight and the wind was still howling. It's time that we forgot our star gazing plan and learned to live in the moment. After all, it was an enjoyable and memorable night. We looked forward to the sunrise next day. Our camp guide woke us up while it was still dark. Time to watch the sunrise on a camel! I had previously heard that Sahara camels were dromedaries. It was right. All the camels we saw were one-humped. Surprisingly, they were all tied together in a rope following the camel guide.  The tourist seat was set on the hump. The guide gave a yell and the friendly camels lay down to offer us seats. 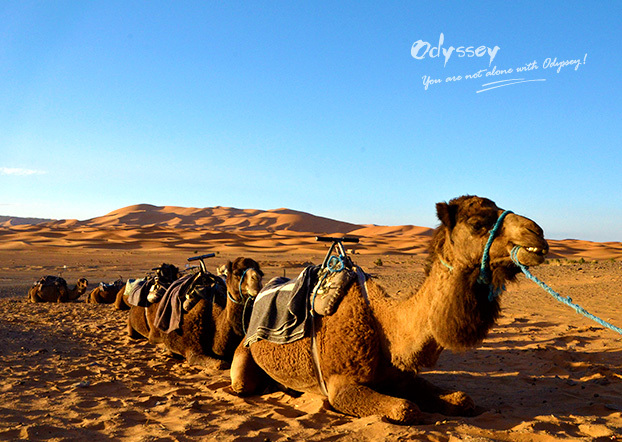 The camel trek was a relaxing experience. Their humps swayed back and forth and their feet swooshed through the sand. The wind vanished without a trace. The desert was clean like it had just been washed before. And the sky was blue. The soft sand dunes stretched as far as our eyes could see. The sky was changing slowly from black to grey and there was an orange dot in that grey. The dot got larger and then became orange-red. The remote desert was also brightened. It was brighter than ever before. There appeared increasing stripes of orange-red clouds, branching, diffusing, and growing lighter until they could no longer block the sunray. "The sun's come out ", we shouted thrillingly. The gentle sun, after breaking through the wisps of cloud, finally showed up. The morning sunshine awoke the Sahara from a night's deep sleep. It's time to wave goodbye to her, at the time when she's most beautiful before the unbearable hot heat came. Having not seen the spectacular starry sky on the dessert, we were a bit regretful to leave. Yet we were grateful that we were able to see the stunning sunrise and sunset. 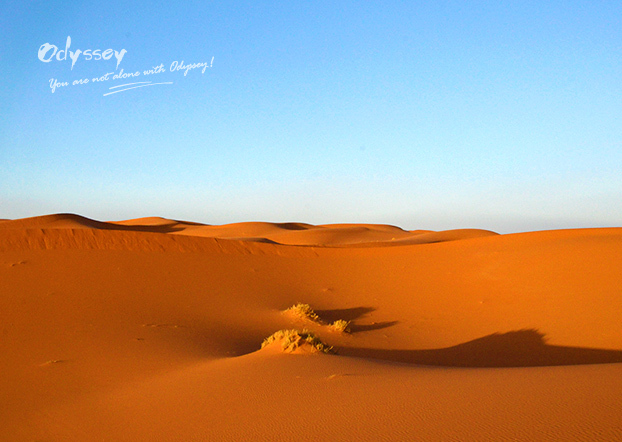 We long for our next Sahara experience and hopefully see the starry sky. Egypt is a very popular destination known for pyramids, mummies and numerous historical sites, but is still mysterious to many travelers. 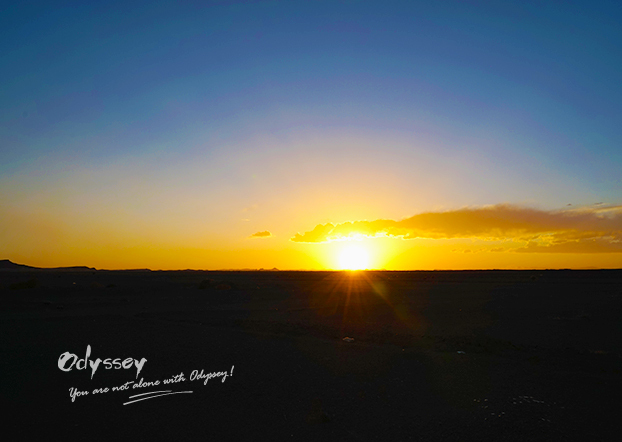 Here I answer the most frequently asked questions about Egypt to help make your travel as enjoyable as possible. Few small countries on earth are packed with so much history, culture and natural beauty as this tiny Middle East nation. Here are seven of the best reasons to visit Israel. For Muslims worldwide, Ramadan is the anniversary of the revelation of the Quran to Mohammed, the prophet of Islam, and thus the most holy month. While for non-Muslim travelers, it can also be a celebratory holiday and spiritual experience. 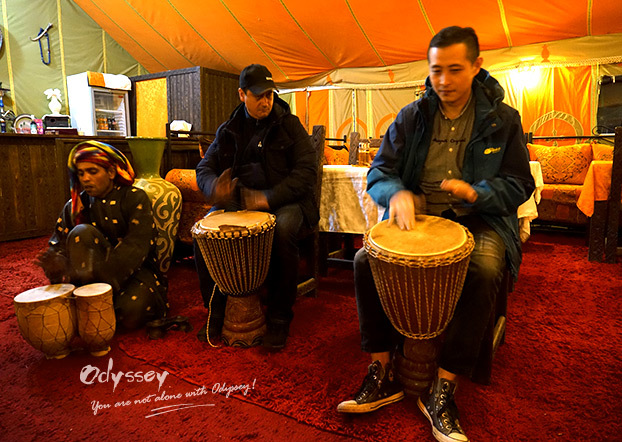 A travel expert at Odynovo, Miranda Zhang is especially keen on destinations and local cultures of the Middle East and South Asia. For any questions or inquiries, write to , or read more tips by Miranda.